Narendra Modi, who represents Varanasi in Lok Sabha, regretted that he was unable to attend the event. Legendary Ghazal singer from Pakistan, Ustad Ghulam Ali performed at the event on the first day of the 92nd festival. The Sankat Mochan Sangeet Mahotsav, held continuously for the past 92 years on the occasion of Hanuman Jayanti, had an unusual guest on Wednesday. Legendary Ghazal singer from Pakistan, Ustad Ghulam Ali performed at the event on the first day of the 92nd festival. Though many famous Hindustani classical vocal and instrument maestros have graced this festival in the past, which is held at the main “prangan (courtyard)” of the revered Sankat Mochan temple here, it is the first time that a singer from the neighbouring country performed here. Wishing that he could be present at the festival, Prime Minister Narendra Modi, who represents Varanasi in Lok Sabha, regretted that he was unable to attend the event due to his busy schedule and expressed the hope that he would be among the audience in the future. “I do wish I get the opportunity to attend such a programme in future where so many well known artistes will be enchanting the audience,” Modi said in a series of tweets on Tuesday. 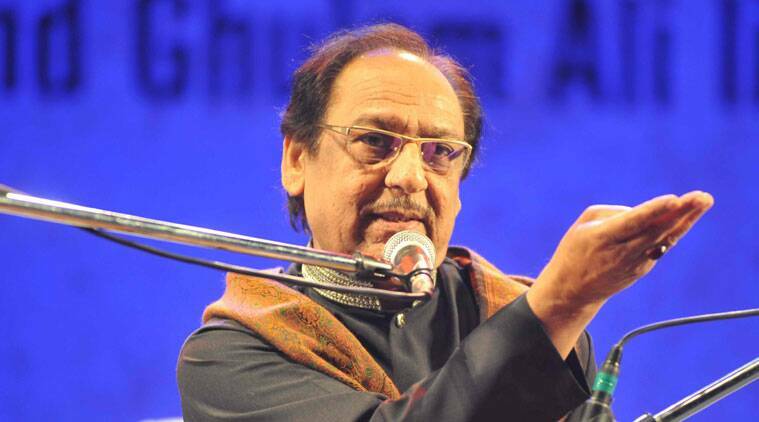 “I must share that I have heard Ghulam Ali Sahab in the past & that too in person. Also read in the papers that Ghulam Ali Sahab wished that I attend the programme. Unfortunately, this time I would not be able to do so,” he tweeted. “My best wishes to the organisers of the ‘Sangeet Samaroh. Several renowned musicians will be gracing the programmes,” Modi said on the social media. Dr V N Mishra, younger brother of Prof Vishwambar Nath Mishra, the head priest, who was at the helm of the festival said: “Definitely, the first day crowd is due to Ali’s visit,” he said. “Anup Jalota had come last time. There was some crowd. But this time its double that,” said Shatrughan Mishra, a BHU student, who has been coming to the festival for the past four years. Today, he could not find a seat in the main courtyard and was part of a “double queue” that had lined up by a small window that opens into the courtyard. Youngsters pushed and craned their necks to catch a glimpse of Kathak recital by Pandit Birju Maharaj. Flute maestro Hari Prasad Chaurasia, renowned vocalist Pandit Vishwanath, vocal legend Pandit Jasraj, waited in the wings. “Barring a couple of times, I have never missed this festival since 1972. The only times I missed were due to logistics issues. I got angry with organisers, but I feel Lord Hanuman was telling me that it was he who did not want me to perform. I come here because I am a devotee of Hanuman,” said Pandit Jasraj. Jasraj said it was that Ali, “a very good artist, has come”. Chaurasia, too, said he comes here “only because of Hanumanji”. “As far as Ghulam Ali is concerned, we are likely to chat about our art and craft. That is what musicians do. He is a good man,” the flautist said. Even as the crowd waited patiently past midnight to hear Ghulam Ali, V N Mishra, the Head of Department of Neurological Sciences in BHU, said he was likely to begin with “something traditional” which may include Chaiti and Thumri. Chaurasia was performing when the last reports came. He was to be followed by Pandit Vishwanath and Ghulam Ali.